The husband and I never go beyond our comfort vegetables – carrots, beans, ladies finger, capsicum and brinjal. Infact carrot and beans are always in stock and I am sick of trying to make something with them. Slowly we ventured into beetroot and bottle gourd but there are vegetables that we would not just touch or for that matter buy. Ridge gourd is one of them. I keep reading about the benefits of these vegetables and how good they are for health and somehow wanted to use these in our diet. My colleague at work once shared her tiffin with me and it had an awesome chutney along with aloo subzi. On inquiring I found out about this Ridge gourd chutney and she was sweet to share her recipe with me. Ever since, I make this chutney once in a while to go with our idlis and dosas for morning breakfast. This is super tasty as coconut chutney sans coconut. 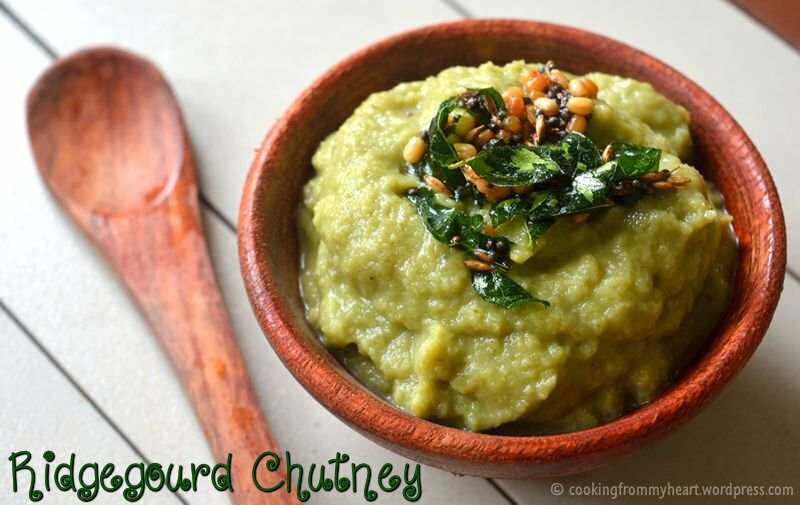 Only a tsp of oil is used in making this chutney, totally guilt free I say. The texture is quite smooth and full of flavor. I use the skin of the Ridge gourd too, which is full of fiber. So, this is a healthy alternative to the coconut chutney. Wash the Ridgegourd and chop it into chunks while keeping the skin on. Chop the onion into largish chunks too. In a pan, heat half tsp of oil and add chopped onion, Ridgegourd, green chillies, peeled garlic pods and tamarind. Add required salt. Keep the flame on low. The onions and Ridgegourd would sweat and release water, which would be enough to cook everything. As all the water evaporates and the vegetables look cooked, switch off the flame. Let the mixture cool. In a blender, blend the mixture into a smooth paste. Remove onto a bowl. In a small pan, heat oil. Add mustard, jeera and urad dal. As mustard and jeera splutter, add curry leaves. Switch off the flame. Add the tempering to the chutney. While using the skin of the Ridgegourd, make sure the Ridgegourd is tender. Else, it can be quite fibrous. If you don’t wish to use the skin, peel it off and use only the flesh. 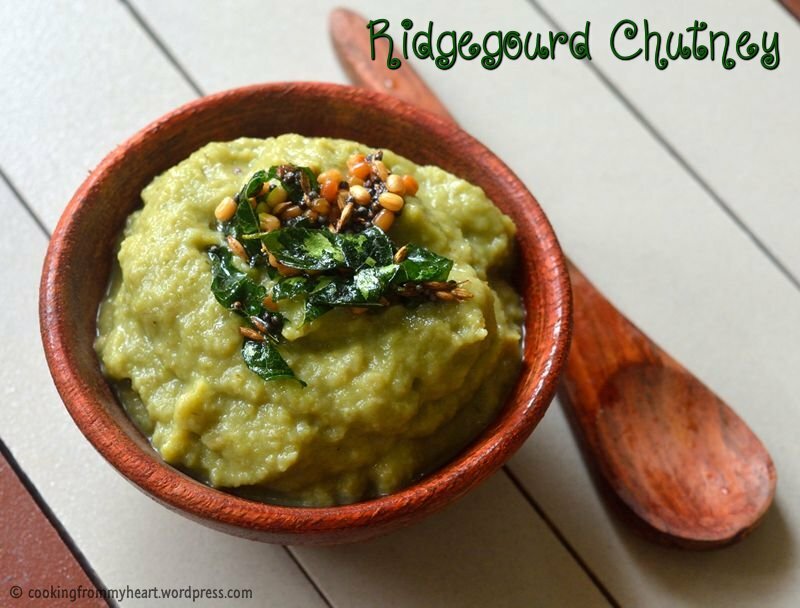 This chutney would be on the sweeter side, due to the sweetness from Ridgegourd and onions. Add chillies accordingly. To keep up the beautiful green color, I only use green chillies. Red chillies can be used too. This chutney stays fresh in the refrigerator for 2-3 days. 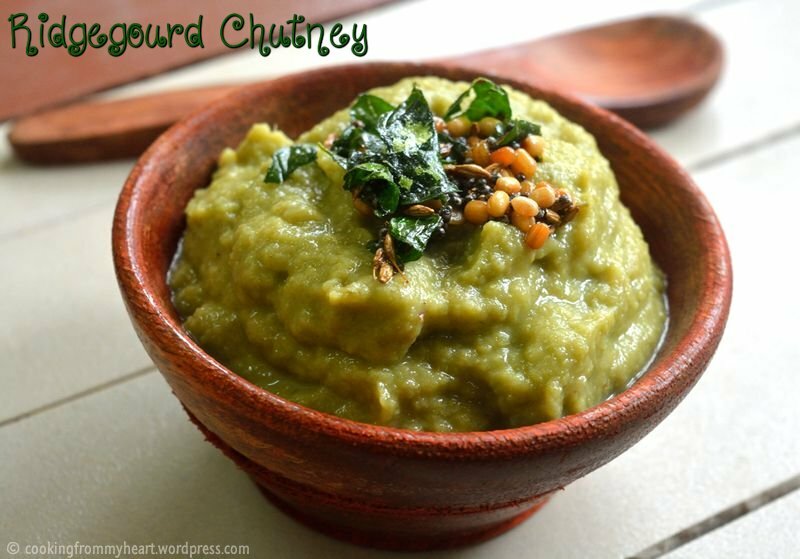 I love this chutney..yumm… loved that bowl GB. You also prepare similar chutney with the ridge gourd skin. We make kootu with the pulp and chutney with the skin. But the peels should be tender though.. Thanks Vidhya 🙂 Yeah amma makes ridge gourd peel chutney, since I wanted to use it for idli and dosa, I wanted to have a little body to it 🙂 yeah, I once made this with hard peels and it was not good at all. Lesson learnt! 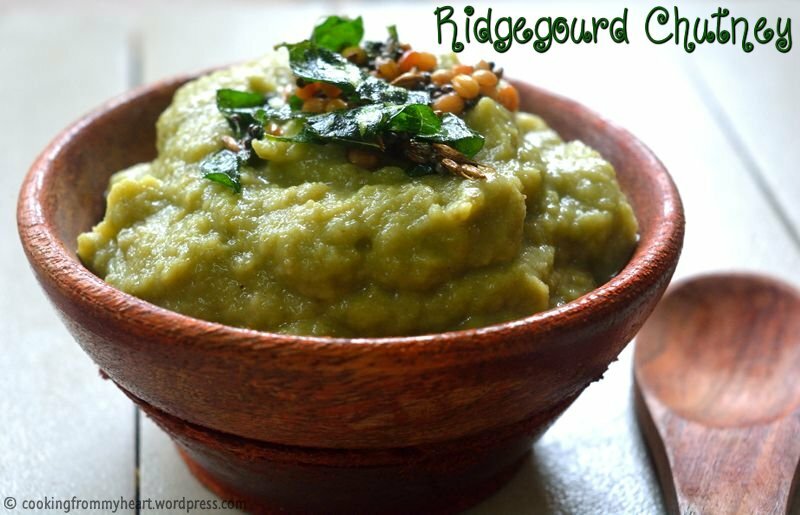 We make ridgegourd chutney in raw form.